The TLC original, 90 Day Fiancé, has had us glued to our seats, popcorn in hand, as we watch the drama filled series. The premise of the show revolves around couple who have met abroad. They are followed through their journey to get their loved foreigners a K-1 visa (fiancé visa), and eventually get them to the United States. During the 90 days, they are to get married in order to keep their love safely and legally within the United States. Larissa and Colt — One of the most chaotic couples on 90 Day by far, Larissa and Colt have made us both laugh and cringe. Their love story begins on an online chat. After some time, they decide to meet in Mexico, ending in an engagement after only five days. Colt, a Nevada resident, brings Larissa with the K-1 visa. However, Larissa hasn’t even made it out of the airport, and she’s already complaining. This goes on in the car, and all the way until they get to the home. Repeatedly, Larissa complains about everything. She dislikes Colt’s home, car, cats, and even his mother. Their episodes are full of attacks from Larissa in front of friends and family, and Colt’s mother trying to sabotage their relationship, while Colt simply tries to hang back. Mohamed and Danielle—This is the most chaotic couple by far. A 26 year old Mohamed met a 41 year old Danielle on an online chat. The Tunisian nativewas granted the K-1 Visa and arrived in the United States to a disappointing life. Many fans believe Mohamed never intended to marry Danielle. The evidence is in the fact that he repeatedly said he wanted his green card, but never said he loved Danielle. During their wedding, Mohamed refused to kiss his bride, claiming he couldn’t do so because of the Islamic holiday of Ramadan. After receiving legal approval, Mohamed left Danielle, and moved to Florida. He only responded to her when she threatened to get him deported. Their episodes are a rollercoaster of emotions, leaving fans feeling sorry for Danielle. These couples have granted us many nights of juicy reality TV. Although not all couples have lasted, they made one great series. 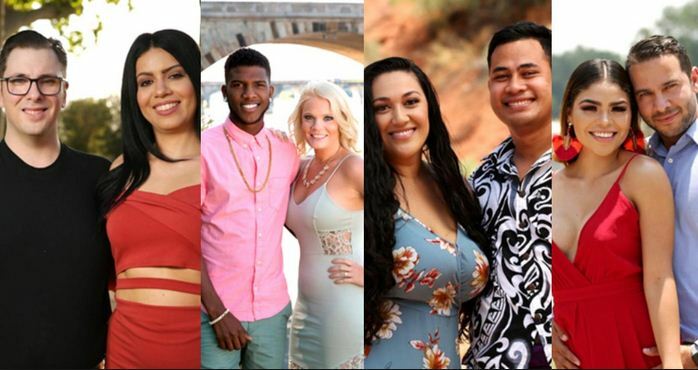 The couples that are still together, will be coming back for the WE spinoff, 90 Day Fiance: Happily Ever After. Thanks TLC, we’ll all be waiting!